I know, kind of cheezy, but helpful to middle schoolers trying to remember the parts of speech; or in this case, the parts of writing. Here’s a quick comparison of how this works in the writing world. Notice that I only changed one word, yet each sentence carries a different feel. Sentence one sounds bland. Sentence two gives us the impression that she (whoever she is) is angry with him (whoever he is). Sentence three tells us that she may be flirting with him. Try it! I bet you’ll like it. Epic fight scenes are one of those must-haves for a good portion of modern movies. The inspiring hero music and expertly choreographed stunt moves gets our hearts pounding, and we leave with the feeling that something truly heroic has taken place. But how do we depict an epic fight scene in a book? We can’t rely on music to stir our feelings, and we can’t describe a ton of stunt moves because—let’s be honest—it would bog down the narrative. Here are a few tricks I use to create an epic fight scene. Describe individual moves when needed, but only when needed. Remember that part about bogging down the narrative? We can’t get too caught up in the minutia if we’re going to create a sense of rapid occurance. Include point-of-view narrative. Just because it’s action doesn’t mean we can forget about the POV we’ve been following. Thoughts and feelings will help us get a sense of how the action is affecting our character. Include the character’s expectations. Does something happen exactly the way he/she thinks it will? Or does it take him completely off guard? Add key details that make an impression on your character. Not just physical motion, but also sound, color, or whatever other sensory details your character notices. I just finished writing a multi page fight scene in my WIP Doctor and King. The main character, Gervaise, is fighting a lop-sided duel against two of the villains. Here is an excerpt—see how many of the above points you can identify. Brute strength does not come much into play in a friendly match, but it can be a vital asset in a deadly duel. Clara was strong, for a woman, and fierce, but I could strike heavy when I wasn’t afraid of the result it might have. Even with the leverage she had with her sword, I found If I struck hard and true, I could beat down her guard. My gauntlets scraped across my own blade as I used the entire length to block and then shove Clara backward. She recovered herself, and I saw her dart a glance aside, breaking her focus on me. As I sprang forward, she retreated and circled back. She set her jaw, then renewed her fury, which I blocked with equal energy. Calvin was right: skill with heart was better than skill alone. I cannot say which I heard first: Vannie’s cry of warning or the sudden command in my soul—move! Either way, I understood both at once, and whirled away from the combat. I barely avoided being stabbed by a dagger with black etching on the blade—I saw it as it whisked past my chest. Carl bared his teeth in a snarl of rage as he struck past me. Treachery! What are your favorite epic fights? Tell me in the comments. P.S. Need a FREE short story to enjoy? It doesn’t have any duels, but it is epic. Click here to read The Sea Near The Moon. Crescent Tides: a must read. I just finished reading an amazing, wonderful book! These days I don’t have a lot of reading time, but I’ve been making time to read and review books on interviews and reviews. Last month I picked Crescent Tides by J. Aaron Gruben. And boy was I glad I did! Let me ‘splain to you how the book goes. A stressed out Veterinarian and his friends accidentally stumble upon (and activate) a time machine created by a fanatic terrorist. The terrorist’s purpose? To go back in time and change the historical battle of Lepanto in order to create a modern Islamic state governed by his own family. The Veterinarian and his friends become trapped in the medieval era, fighting in a war between Christendom and the Ottoman Empire that wasn’t supposed to be influenced by machine guns and grenades. Can they undo history gone wrong? And will they ever return to their proper century? Intrigued yet? I sure was! 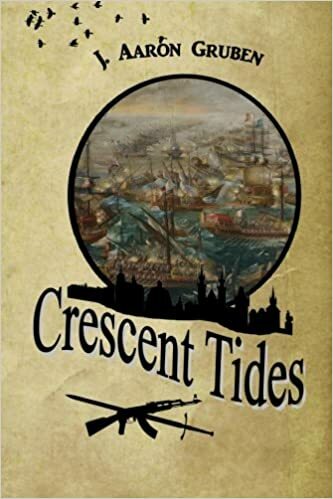 Crescent Tides is a masterful blend of Historical Fiction and Sci-Fi, with beautiful historical details, peppy dialogue, and an enlightening contrast between the modern era and the medieval. I don’t say this often, but I’m saying it now: This book made my top ten favorite books ever list. I certainly count it a must read. I decided to share the opening few paragraphs from my work-in-progress, Doctor and King. Enjoy! I wasn’t a very imposing king, as far as kings go. To begin with, I was not tall, or especially handsome, or any sort of regal. I was not especially short, I might add — but I was enough shorter than average that only a nice set of high-heeled boots would give me the illusion of average height. And I wasn’t about to stoop to that level. Or raise to that level — whichever suits you. I wasn’t particularly buff looking either. Actually I was quite strong (I could bend a hundred-pound bow without straining, and could throw a man bigger than me to the wrestling mat with ease) but I looked more like a walking barrel than the sort of fellow you see parading down the streets with his shirt off. Not that I was fat, mind you. That is, I did carry a tiny bit of extra weight, but not much at all, you understand. And besides not looking very imposing, there was this problem of age. I was twenty years old, and still under co-regency until I was twenty one. My mother was the co-regent. Yes, I confess she was; and that gave me the horrible stigma of being the biggest mama’s boy in the entire world. What a thing for a king to have to live down! Not that I blame her. My father set her up as co-regent before his death, and I am grateful indeed that I could always trust her. It was certainly a blessing to not have to fear that my co-regent might have other designs on me than keeping my kingdom safe. But the thing was, you see, that I seem to have inherited my lack of ruling skill from her. So we made a pretty pair of co-regents, I can tell you! Ever since it began, when I was twelve, I was clumsy and forgetful in my ruling role, constantly in need of my many counselors, and my mother was flighty and anxious. And both of us were sadly naïve when it came to politics. That is how things came to be in the state they were when I turned twenty. You see, my kingdom (which was known as Averon ) bordered the kingdom of Sharrilok, the junction being in the middle of a mountainous area. The border was somewhat vague, apparently, which no one bothered to explain to me until it was too late. No one was concerned about the vague border, however, until we opened an iron mine right beside it. Then — oh heavens above! — the fountains of the deep broke open. The people of Sharrilok insisted that the mine was on their land. To make a long story short, we went back and forth, and forth and back in messages and complaints and all sort of other tarnation with the other king. Then we had people from Sharrilok coming in and trying to work the mine with our people, and our folks of course were angry and drove them out, unfortunately killing a few in the process, and then of course they retaliated, and so on and so forth. So really, we were on the brink of war. So I thought I’d answer some questions about my novel-in-progress, a.k.a, Doctor and King. What is Doctor and King about? It is a real-world re-imagining of the Sleeping Beauty story, told from the perspective of a young king with insecurity issues and a penchant for mixing healing tonics. How close are you to finishing? I’m about one inch away from finishing the first draft. I’m hoping to have it revised and edited and ready to release by the end of the year. What is the hardest thing about writing this novel? Probably one of the hardest things about writing Doctor and King is that I’m still getting used to writing in first person. Most of my work over the past ten years has been third person. What do you like most about this novel? Ha ha, I love that the main character is halfway based off my husband. That really makes it kind of funny to write, because his personality is way different from mine. So it really stretches my mind, trying to think from his perspective. If you have a question you’d like answered, whether about Doctor and King, or about writing in general (I love helping out young writers!) feel free to send me a message.